Burgers from the grill just taste better. Recipes and tips for building the best backyard burgers are here. 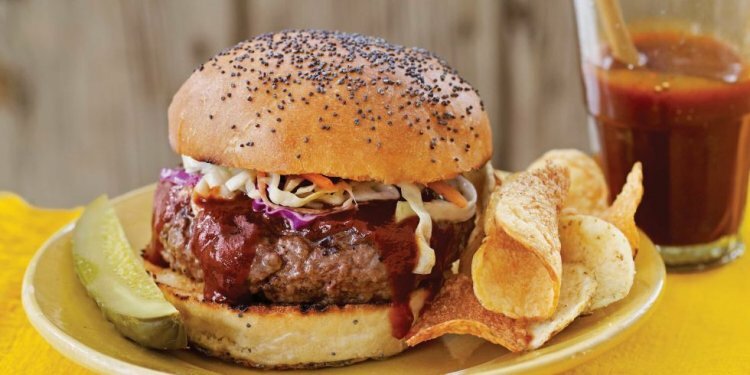 When a hamburger is done right, you know it–the smoky, char-grilled outside and the juicy inside, all barely contained within a chewy, toasty roll. That’s what a burger is all about! Here are some grilled burger basics. Use beef that is no leaner than 85%. Meat with a higher fat content will be juicier and more flavorful. But be aware, patties from higher fat meat will shrink more when they cook. If you shop at a grocery store or a butcher that grinds their own beef, choose coarsely ground beef for juicier burgers with a more pleasing texture. For ground chicken and turkey burgers, add a little olive oil to the mixture. Wait on the salt! Don’t combine salt into the mixture, especially if you’re not going to grill the patties right away. Salt will extract moisture from the meat, leaving you with dry burgers. Instead, sprinkle each burger with salt right before you put it on the grill. Don’t Mix Too Much. Use a light touch when combining seasonings with the ground beef. If you mix it too much, your burgers will be dense and heavy. Let the Flavors Mingle. Leave the meat mixture (or patties) in the refrigerator for several hours to allow all the flavors to mingle. To form patties, wet your hands a little to keep the meat from sticking to them. If you make patties ahead of time, stack them on a plate separated by waxed paper and cover with plastic wrap before you put it in the refrigerator. Form a Good Patty. Don’t form patties too thick or too thin. A 3/4-inch thick patty is ideal. To keep patties from swelling in the middle, make small indentations in the center. Make sure the grill is the appropriate temperature. medium-low to medium heat is best. Too hot, and burgers burn on the outside before getting done on the inside. Keep the lid closed while cooking; it shortens cooking time and keeps burgers moist. Always start with a clean, oiled grill grate. This keeps burgers from sticking, extends the life of your grate, and helps put those beautiful grill marks on your patties. Turn Once. It’s hard to resist, but try not to flatten your burgers with the spatula. It squeezes out flavorful juices. Cook burgers properly. Cook ground beef to an internal temperature of 160 degrees F (170 degrees F for poultry). For an accurate reading, insert the thermometer into the patty horizontally.